Summary: Callie sits on the front porch and surveys “almost everything we own” spread across the yard. Callie and her family are moving to a small apartment in the city and can’t take these things with them. Callie watches people touching their things and asking the price. The headboard where she was keeping a record with a crayon of the number of times she had read Goodnight Moon sells for less because of the marks. Sara, Callie’s best friend from next door comes over and asks, “Why do you have to move?” Callie explains it has something to do with money. Callie sees a man taking her bike and runs over to grab it. Callie wilts with sadness as more things are sold until a woman comes up and says, “You’re so cute. Are you for sale? Callie, crying, dashes to her parents. I’m not for sale, am I? The parents promise, with hugs, that she will never, never, be for sale. Then Dad calls to all the people in the almost empty yard, “Help yourself. For free. We don’t need any of it.” Callie feels OK now because “we are taking us” to the new home. Literary elements at work in the story: Callie, possibly four or five, is the narrator of this sad event. It is told simply with her sense of uncertainty, fear, and sorrow in the face of change The story is immeasurably enriched by the illustrations done in watercolors and ink outline. Callie is a small figure in a large yard among many things. Her expressions of dismay, anger, sorrow are apparent through the pictures. Eve Bunting has written over 250 books, many of them dealing with significant social issues. I think I would have arranged for my child to spend the day with a friend while this sale was going on. How does the perspective on gender/race/culture/economics/ability make a difference to the story? The family is moving because of a reduction in finances. Several races are included in the pictures. Other perspectives do not apply. Have you ever moved? What does it feel like to leave a home? What did you want to take with you? Look through the book and name some of the emotions that Callie is feeling. What things could you give away today and still live happily and comfortably? What is your favorite toy or game? How would you feel if you had to sell it? What does it take to make a home? Do you think the new apartment will become a home for Callie and her parents? This review was prepared by regular contributor Virginia Thomas. 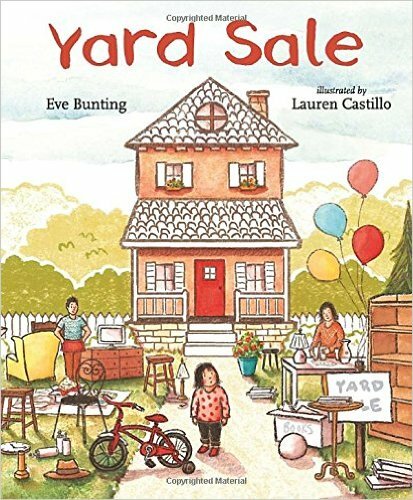 Yard Sale by Storypath is licensed under a Creative Commons Attribution-NonCommercial 4.0 International License.